The cold, bitter battles, the endless sieges and amazing sacrifices—all this and more in your FREE report. How much do you know about World War II’s Eastern Front? The intense tank battles between Germany and the Soviet Union in Ukraine’s Bloody Triangle? The gruesome three-year Siege of Leningrad? Or the intense fighting at the Battle of Kursk? Although often overlooked, the Red Army’s daring defense of its homeland is steeped in both heroism and controversy. 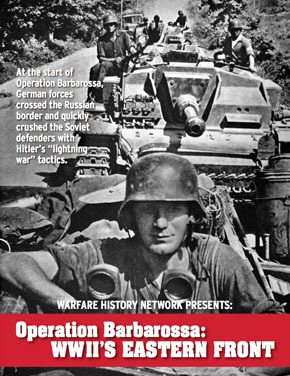 And with this free Russian Front guidebook, you’ll get a first-hand look at the stories and events that shaped Operation Barbarossa, the largest invasion in military history. Your free briefing starts by introducing you to Lt. Gen. M.P. Kirponos, commander of the Red Army’s southwestern forces. After the first day of Operation Barbarossa, he received orders to counter-attack the Nazi invaders at the city of Lyublin in eastern Poland. But little did the Soviet Union’s high command know that by this time, Lyublin was over 80 km past the German line; the Nazis were advancing at an incredible rate through the Russian homeland. It was a fool’s errand, but Kirponos was determined to carry out his order. But as you read on, you’ll soon realize that his problems weren’t restricted to the advancing German army. His five mechanized corps were scattered across northwestern Ukraine, and communication was extremely difficult. Motorcycle couriers were used for long-distance communication, and Soviet tank commanders had to resort to hand and flag signals. Kirponos had no hope of concentrating the mechanized corps for a proper counter-attack. A “Giant With the Feet of Clay”? The German and Soviet tank divisions clashed on June 24, 1941. The area that saw the heaviest fighting was an 800-square-mile stretch of northern Ukraine that became known as the Bloody Triangle. Arrogantly referring to the Soviet Union as a “giant with the feet of clay,” the Germans were confident that like their previous encounters, the Red Army would soon crumble under their advancing panzer groups. But as our free guidebook will show you, conquering the Bloody Triangle wouldn’t be as easy for the Germans as they first believed. How did the Red Army defend itself against such a formidable adversary? How could they hope to stop the German advance when the Nazis were better equipped, better organized and better trained? Download your free Russian Front briefing to find out! The fighting at the Bloody Triangle was intense, but as you’ll learn, both the Red Army and Soviet citizens would experience immeasurable hardships as Operation Barbarossa continued. Our free guidebook will also give you an in-depth look at one of the longest and most devastating battles of attrition in the history of war: the Siege of Leningrad. Used as an old imperial capital, Leningrad was once the Soviet Union’s window to the west. It had a turbulent history prior to World War II, but you’ll discover that its rocky past was nothing compared to the agonies it would endure from 1941 to 1943. Beyond facts and dates, you’ll get to know all the famous leaders on both sides of the Leningrad siege. Men like Field Marshal Wilhelm Ritter von Reeb, commander of Germany’s Army Group North. His refined Blitzkrieg strategy was proving very effective along the Eastern Front, and as his army advanced farther into the Soviet homeland, Leningrad was his primary objective. There’s also the Red Army’s ruthless Marshal K.Y. Voroshilov, named supreme commander of the Leningrad Front; you’ll read all about his desperate attempts to maintain order among the Soviet ranks by removing or executing his incompetent commanders. We also go beyond the front lines to examine the Soviet Union’s aggressive propaganda campaign to hide the truth of the war from its citizens. During the bloody Battle of Leningrad, both the press and the radio fell silent, and all information coming out of the Soviet Information Bureau was either deliberately vague, or outright lies. As any history book would tell you, the numbers behind the Siege of Leningrad are stunning: 3.4 million losses in the Red Army alone, 1.5 million civilian casualties, 15 million square feet of houses in ruins. But our Russian Front guidebook digs deeper, giving you exclusive insight into Germany’s strategy, the Soviet Union’s internal difficulties and the heroism and havoc that shaped the bloodiest chapter of Leningrad’s history. Finally, our Russian Front guidebook takes you into Kursk, where Germany experienced one of its most critical setbacks during Operation Barbarossa. After the hard fighting during the Frontline Battles of 1941 and the losses endured at the Siege of Leningrad, Red Army commanders tried desperately to anticipate Hitler’s next move. Inside, you’ll learn why they thought an invasion into the Kursk salient the most logical step: for starters, the Germans could take their panzer divisions in Orel to the north and Kharkov to the south, and pinch Soviet forces into a two-front attack. So what did Soviet high command propose to do? You’ll read about Stalin’s full-out offensive strategy, and why it was quickly rejected by senior staff, who wanted to concentrate on debilitating the German panzers instead. How would they accomplish this? By developing some of the most widespread fortifications along the entire Eastern Front. You’ll follow the Red Army all along the Kursk salient as they build thousands of gun emplacements, and an elaborate trench network that spanned over 65 miles. Stalingrad is often referred to as the turning point of World War II. But by downloading our free Russian Front guidebook, you’ll learn why the Battle of Kursk, a.k.a. “Operation Citadel,” is often seen as the more decisive loss for Hitler during the eastern campaign. If you’re like me, you’ve already read quite a bit about World War II’s Western Front. You’ve seen Band of Brothers, Saving Private Ryan and The Longest Day. But what about the events along the Eastern Front, where some of the most casualties, the largest campaigns and the heaviest sieges in the history of war took place? If you want to jump feet first into the key events of Operation Barbarossa and the Red Army’s brutal contributions to the Allied war effort, download our Russian Front guidebook today. It’s guaranteed to offer you new insight into the key commanders, the campaigns and the Soviet Union’s immense sacrifices, and best of all, it’s absolutely free. P.S. Did you know that it was the invasion of Sicily, not the actual fighting at the Battle of Kursk, that forced Hitler to eventually call off Operation Citadel? Download your free guidebook to find out why! Concering the ps, I think a number of allied operations floated on Russia’s blood. P.S. Did you also know that if it wasn’t for Stalingrad and Kursk, the Allies wouldn’t have landed in Sicily, much less Normandy? 80% of German casualties were suffered on the Eastern Front.